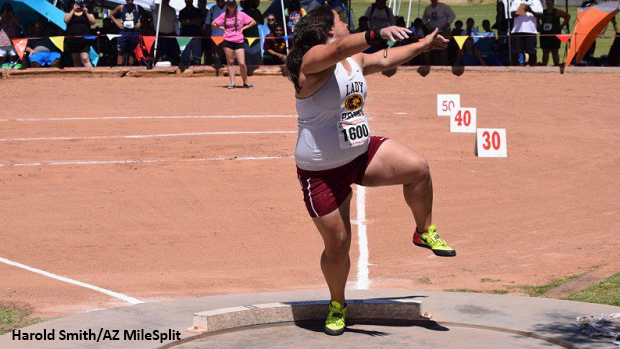 Almost two years ago, Kayleigh Conlon set the State record in the girls shot put at 47-9.5. Cut to a year later, we had seven girls throwing over 40-feet in the Shot-Put contest. Alexis Jones (Queen Creek, 2018) was the State leader last year with a lifetime best of 45-6 at the AIA Track and Field State Championships. The top returner from last year is Alaina Diggs (Millennium, Sr.) who threw just over 45-feet in the D1 Girls Shot Put at the State Meet. During the spring of last year, Diggs started working with Throws Coach Erik Johnson of Arete Throws Nation to improve the mechanics of her throws. According Coach Johnson, "She's got this crazy-raw ability, so she's very athletic and very tall and yet very quick and body-aware which is always good." In addition to throwing shot, also Alaina plays basketball during the winter which interrupts her progression as a thrower. Though she will likely get back into the groove quickly enough to confidently secure early season victories, it sounds like it'll be a while before she throws close to Conlon's record. Coach Erik Johnson is the creator behind the trademark Throwing Chain Reaction system that has helped developing throwers and coaches around the world. 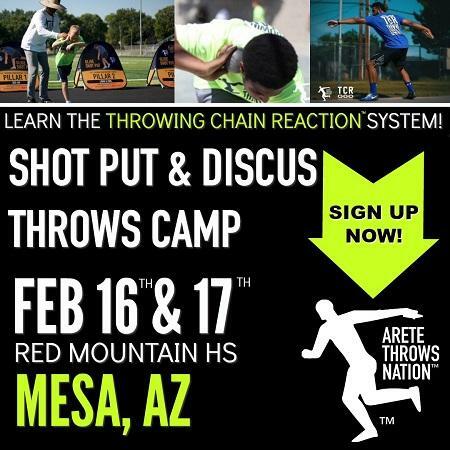 "It seems there's always a shortage of throws coaches and a huge rate of turnover, but if a coach comes in and learns the system, then the athletes will have an understanding of how the throw works.